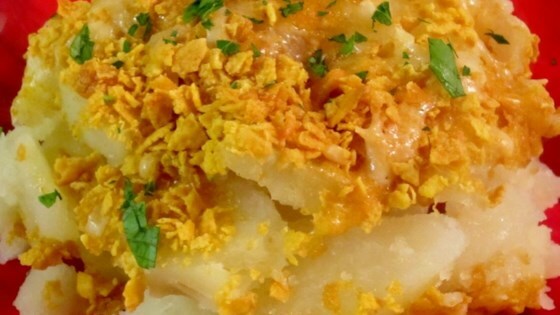 "A very quick, easy, and delicious potato side dish with a crunchy cheese and cornflake topping!" Preheat oven to 375 degrees F (190 degrees C). Pour butter into a 9x13 inch pan. Arrange potato slices in a single layer over the butter. Combine the cheese, cornflakes and paprika in a bowl and sprinkle the mixture over the potatoes. Bake in a preheated 350 degrees F (175 degrees C) oven for 20 minutes or until heated through. I used real potatoes and added salt and pepper, but it was a nice change for a potato side dish. My husband and I really loved these potatoes. I didn't have any problem with there being too much butter, but I do agree that they could use some additional spices. These are crunchy and good. Quick, simple and delicious. My family raved about it.